"And he well said, "a righteousness of mine own," not that which I gained by labor and toil, but that which I found from grace. If then he who was so excellent is saved by grace, much more are you. For since it was likely they would say that the righteousness which comes from toil is the greater, he shows that it is dung in comparison with the other. For otherwise I, who was so excellent in it, would not have cast it away, and run to the other. But what is that other? That which is from the faith of God, i.e. it too is given by God. This is the righteousness of God; this is altogether a gift. And the gifts of God far exceed those worthless good deeds, which are due to our own diligence." Chrysostom does not always get his exposition of the Word of God right (cf. Walther's comments in Law & Gospel, ch 7), but when he does get it right, as here, imo he exceeds all the other Fathers in the clarity of his preaching of the Gospel. 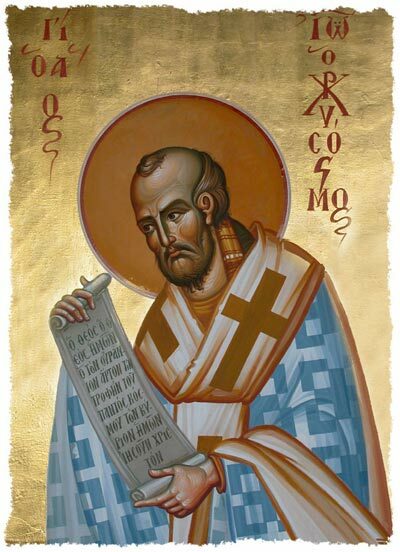 It is salutary to contemplate what might have been if Chrysostom's grasp of the meaning of the righteousness of God had survived through the Middle Ages. As it was, scholasticism distorted the meaning of the term to mean the retributive righteousness of God by which he condemns and punishes sinners. 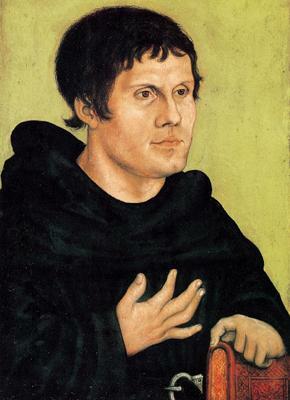 Thus when Luther, meditating on Romans 1:17 in his monastic cell at Wittenberg, was led to realize that "the righteousness of God" was a gift that came through faith, it was as though the Gospel had been rediscovered and the gates of Heaven opened, as he himself tells us: "I was altogether born again and had entered paradise itself through open gates . . . that place in Paul was for me truly the gate to paradise." Seest thou, that faith must not be absolutely, but through good works. (Same chapter, same commentary, a few paragraphs later). ...for he especially BELIEVES that Christ hath risen, who in like sort gives himself up to dangers, who hath fellowship with Him in His sufferings. For he hath fellowship with Him who rose again, with Him who liveth; wherefore he saith, “And may be found in Him, not having a righteousness of mine own, even that which is of the law, but that which is through faith in Christ, the righteousness which is of God by faith: that I may know Him, and the power of His resurrection, and the fellowship of His sufferings, becoming conformed unto His death. Do you see now that what the Fathers mean by this phrase isn't the same as what Luther understood it to mean? Er, Lucian, I'll post your other comments when I get to them, no need for pseudonyms to try and fly in under the radar, so to speak. The fact that you don't understand or believe something doesn't make it inconsistent. It's obvious from his own words that he understands phrases such as 'saved by faith [alone]' in a different manner than you do: that is all I'm trying to explain to you. How about we consider what the holy apostle Paul meant then? I'll be posting a scriptural primer on law and gospel in the near future, d.v. And Saint Augustine was what exactly, if not a monastic?.. Pelagius' error consisted in thinking that good deeds can be done apart from grace (John 15:5). Believing that good works are necessary for salvation is not Pelagianism. There's a difference there. You're quoting out of context. The words "a righteousness of mine own" have already been explained by Chrysostom himself. And the words "those worthless good deeds, which are due to our own diligence" mean the same. I also thought you knew me enough by now to know that my use of `pseudonyms` has nothing to do with "flying under the radar", and everything to do with my twisted sense of humor.. Anyway, read your church history - the most vociferous responses to Augustine's theology of grace came from the monastics of southern France (or Gaul, as it then was). Monasticism has always been inclined to semi-Pelagianism. The enemy of my enemy is NOT my friend..
From what little I know of Church history, I can tell you that, as a thumb-rule, Orthodoxy has always been the "golden mean" and "middle way" between two opposing extremes. The fact that Augustine is very vociferous against Pelagius, or Monophysites against Nestorians, doesn't mean that they're 'ok'..
Btw, another Chrysostom quote coming soon! Heresies are not full-lies, but half-truths. Deformed or partial truths. Orthodoxy is the fulness of truth. Extremes always obscure other sides of the truth.